Reading and Playing Guitar Melodies: A Step-by-Step Approach is designed to teach guitar students of any skill level to read standard music notation. In conjunction with a good rhythm guitar/chord method, this book provides an excellent course of study for the beginning student. More advanced students will find plenty of melodic and harmonic twists and turns to perk up their ears and keep them engaged and challenged. Learning to read music on guitar doesn't mean having to suffer through nursery rhymes, old familiar folk songs, or simplified pop songs. In this easy-to-follow book and audio package, renowned guitarist and teacher, Ken Arconti presents 119 exercises written specifically for developing reading and technical skills and 54 original songs notated in the same manner as the lead sheets (or charts) you would find in the recording studio or on the bandstand in a professional music environment. There are rhythm guitar backing tracks for all of the songs in the book played at slow and fast tempos. With clear explanations and practice tips, this time-tested, step-by-step method teaches you the essentials you need to read and play melodies on guitar. This book includes exclusive access to downloadable play-along tracks, note reading in first position, timing and counting, alternate picking and fretting techniques, major, minor, and pentatonic scales, music theory, and song form. 1. Fill out all fields in the form below and click the "Send" tab. 2. You will receive an e-mail from ken@kenarconti.com with a link to access the audio tracks. You should normally receive this e-mail within 24 hours. If you do not receive an e-mail within 24 hours please check your Spam folder. If you encounter any problems please e-mail ken@kenarconti.com. Ken discusses his instructional book Reading and Playing Guitar Melodies: A Step-by-Step Approach and the advantages of learning to read standard music notation. Includes excerpts from the book and student performances. "Before completing Ken Arconti's 'Reading and Playing Guitar Melodies: A Step-by-Step Approach,' reading music notation seemed like a foreign language to me. I had previously tried other music notation books but they never proved to be effective. Ken's music reading book was the first that I had found that presents materials in a logical and thorough order without ever seeming tedious. The original pieces that Ken wrote for the book are both pleasing to the ear and gratifying to master. After finishing Ken's book I was able to interpret music notation with ease, and am delighted that a new world of music knowledge, previously inaccessible, is now open to me." -Stephen M.
"I highly recommend 'Reading and Playing Guitar Melodies: A Step-by-Step Approach' as a fun and engaging method for learning to read music. With Ken Arconti's book I gained confidence in my ability to read notes AND to understand the written notation for rhythm, and all those other inscrutable abbreviations that indicate how to play a piece of music. After working through Ken’s book, I can now see a piece of music and actually know what to do with it!" - Dana B. ”I have been using 'Reading and Playing Guitar Melodies: A Step-by-Step Approach' for several months and I highly recommend it. It is written in a clear, concise manner that makes it easy to understand and a lot of fun to use. The book itself is an excellent training and practicing tool and it is nicely complimented by accessing the downloadable play-along tracks for the songs included in the book." 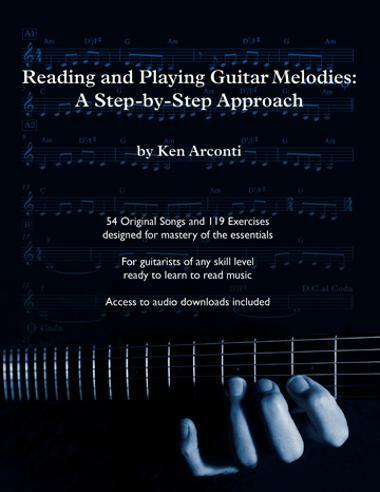 – Garth G.
"Ken Arconti's 'Reading and Playing Guitar Melodies: A Step-by-Step Approach' is like a good teacher, thorough and patient, carefully guiding the often confused or impatient beginning student." – Bill D.
"This is a great instructional book. You will be reading music and playing real songs in no time. The mp3 tracks with slow and fast tempos are great to play along with and enhance the learning experience." - Mark H.